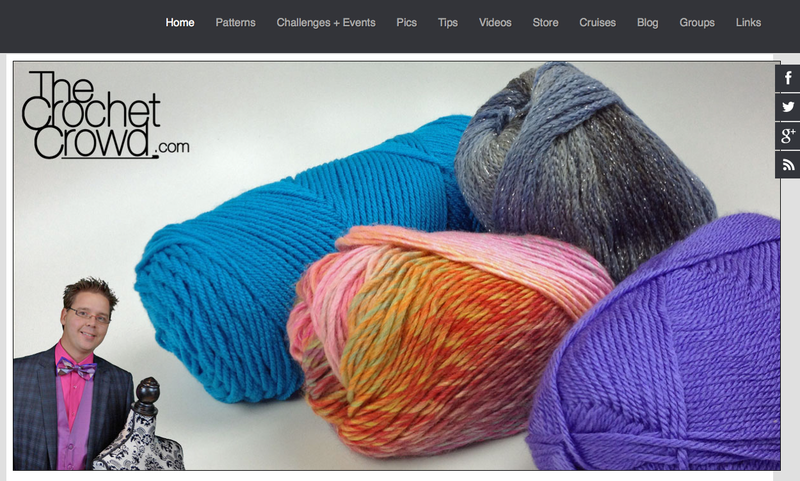 To serve you better, we have done a few changes to The Crochet Crowd Website earlier this week. You will notice the home page is a lot more photographic and not very heavy on content. Like a Google Search Engine and according to my analysis, people really don’t stay on the home page for long. They are wanting the free patterns, challenges and much more that we offer. You will notice the upper top menu above the main graphic as your main navigation to get to where you need to go. Patterns – 100’s of Free Patterns are categorized and available for you to use. Challenges + Events – All running challenges, giveaways and events that Mikey is directly involved with. Pics – Challenge photos and pictures by Mikey during events and much more. There are over 13,000 photos of inspiration on file. Tips – General articles by Mikey. Videos – Our Website is linked with YouTube. The latest videos appear here and are updated in real time when they become available. Store – Need yarn, we have an affiliation with Amazon for yarn and crafting supply purchases. Our store is programmed to what a crocheter would be looking for. Cruises – Our crochet cruises home page to get more information. Blog – Probably thee biggest clicked item. Articles nearly everyday with 5 guest bloggers inspiring you. Each blogger has been assigned to inspire, not sell. Makes for an interesting place to be part of. Groups – Need to find a charity or crochet group in your area? This is it. Due to many emails inquiring about challenges of the past. It has been our mandate to remove out old challenges and giveaways so people don’t accidentally do the wrong challenge. Many people write in that they didn’t have time for the challenge when it was running but have time now and want to do the pattern at their own leisure. Due to me removing out the old challenges, they are unable to find the pattern or see the gallery of inspiration. I’m going to put faith in people that they can read and don’t accidentally complete the wrong challenge or sign up for giveaways that are already done. All old challenges will have a notice at the top of the article stating that the challenge has been completed. All new challenges will appear at the top as it’s organized by date. Older challenges will sink down and allow people to find them afterwards. This change will satisfy those who are looking for the older challenges and allows us to keep it indexed for future reference. This entry was posted in Advice & Tips, Announcements. Bookmark the permalink. The BANG ON expression……is this a Canadian colloquium? I think the changes are great, especially regarding the old challenges. Thank you, Mikey and crew! Mikey is bang on and running one of the most informative and enjoyable websites that I have seen. Keep up the awesome work and thank you for all your hard work? Amazing Mikey…..you just seem to know exactly what we need and want….you are awesome! LOVE the new format! Keep up the magnificent work!!! Meant to say from the crocodile stitch challenge. Thanks again! By the way you are bang on Mikey. Everything looks so much nicer. I am looking for the going home dress pattern from the crocodile stitch. Can you help? Thanks! – and popups would appear constantly. Bravo! Well done. Bang on. Bang on! Thank you for always thinking of us. Bang on. Love what you did with your site. Might I suggest one thing though? Not sure if you can do this, but why not put past challenges under archives instead. Then no one can get the wrong challenges. Just a thought. Thanks for the great friendly user update of your site. Have a great weekend. Congratulations!!! I love the new page.!!! Excellent!!! Thank you!! Looks great and much more user friendly. Yes it is! I noticed that already this week. Great idea. Easier to read and go thru! Great job. Looks so nice and organized. I look forward to looking back at your older challenge. Thank you so much for the reorganization of the website. I am amazed of all the tech work you and the team are responsible for. I look forward to seeing the patterns of the old challenges. I joined the Crowd when the current challenge was the flower pillow and that started my interest to see all these different choices of colors. I begin and end my day with our Facebook page. Happy Hookin’ Day to ya! I like what you have done to this Page!!! Excellent. I need a Red Heart Bag. You see I have been using red Heart yarn since 1972. I am known for a crochet bag Lady. So how can I get One Mickey!! !